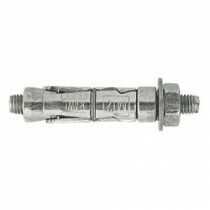 All-purpose expanding shield anchor with projecting stud. For use in concrete, hollowcore slabs, flooring blocks and ceramics. The three-pieces expanding sleeve of maximum expansion provides optimal load and safety of use in any substrate. We offer a wide range of diameters (M6 to M24).